This sound nice, but to me it is still a quite abstract definition and it is not really clear to me how being in a flow works. 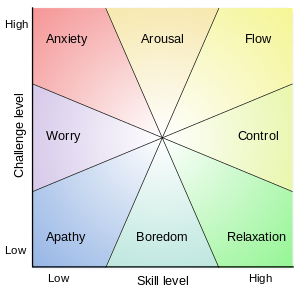 Is there a more low level (cognitive) explanation of being in a flow? I thought that this paper could shine some light on the subject, but I am unable to access it. When implementing or working on a new project in Excel/VBA (Work I'm very comfortable with) I usually start with music to block out distractions and assist in focusing. As my process moves on I'm no longer able to hear the music, though it's still on. My brain is queuing next lines of code to test and my fingers are an output. I am the author and implementation. The code is mine. It's finished when I am. In deep focus, a day that started at 9am and feels like may be 10am is actually closer to 1pm... and I should eat. Every proper step IS rewarding, I'm challenging myself with a problem and completing work. Not the answer you're looking for? Browse other questions tagged cognitive-psychology performance sport-psychology or ask your own question.